AirForceOne Scoped Rifle Slip. 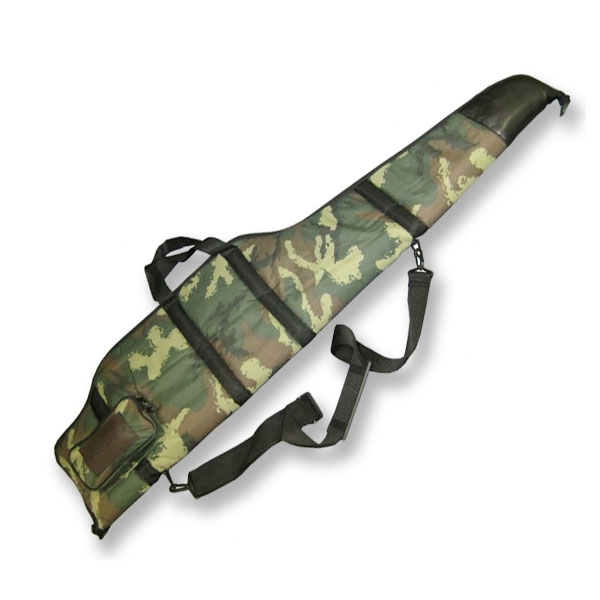 A premium quality gun slip designed to comfortably accommodate rifles mounted with larger scopes. Constructed from highly durable Corduratm 1000D which is waterproof, rot proof, anti-static, tear and fire resistant this slip can take anything that the great outdoors can throw at it. With its 25mm (1”)thick internal padding protects today’s shooters significant financial investment in their shooting gear. As well as being rugged and hard wearing, the slips look good too with real leather trim. The slips dimensions are 130 cm (49”) Long, 30cm (12”) High, with the ‘high-profiled’ section of the slip being 41cm (16”) long and 30cm high. Incorporating both a carry-handle and a fully adjustable shoulder strap: 55cm (21.5”) to 87cm (34”) the slip also features a large Integral accessory pouch: 21cm (8.5”) wide, 14cm (5.5”) deep and a full length heavy-duty zip. Bought for a HW100 with a Yukon fitted.Well made and padded and fits perfect. Good quality but zip opens from wrong end so has to be fully open to insert gun. Zip hard to pull past scope pocket as transition angles are too steep. An element of redesign would improve this gun slip.